Yesterday the EU summit in Brussels all day discussed a single problem: what to do with Britain entangled in Brexit. The situation is such that the matter is not so much whether the British want to or do not want to leave the EU, but whether the other 27 member states and the leadership of the union want to see Britain among them. The Brussels summit late on Thursday gave the answer to this difficult question: capricious and arrogant, as it is now, the British -no. Obedient, not insisting on any privileges - probably yes. Everything will now depend on London and the position of the British elite and society split on this issue, which will be largely determined next week, but finally - on April 12. Arriving in Brussels with a tragic and suffering face, British Prime Minister Teresa May, who will most likely have to leave her post in the very near future, has asked the EU countries to postpone Brexit, which is scheduled for March 29, until June 30. The prime minister hoped that before this time she would be able to persuade parliamentarians to agree with her compromise, “soft” plan of “divorce” with the EU, which, in fact, was impossible, and why it was “stuck” in the House of Commons. If Europeans were interested in preserving Britain in the EU, any delay would be promised to the prime minister in order to gradually turn brexit into fiction, when the kingdom formally came out, but in fact remained in the community, even without the right to vote. But this did not happen: May faced the alienation, or even the gloating, of European leaders, whom Britain had already brought to white heat with its whims and unpredictability, with cynical attempts to use the EU in internal political clashes. As a result, after eight hours of intense debate, the outcome of which May waited on the nerves in the next room without windows, the EU made an informed decision. The postponement will be granted until May 22, because the next day in Europe elections for the European Parliament will begin, in which London refuses to participate. But with one tough condition. Next week, the House of Commons is to approve May’s “divorce” agreement with the EU, which it has already twice rejected with a record majority. If this vote is still held and May, on the third attempt, obtains the approval of parliamentarians (which is very problematic), the postponement will be valid for a full term. If not, then it can only last until April 12, when the campaign for holding elections to the European Parliament starts. In this case, Britain will have another couple of weeks to finally decide its future. The fact that Britain has options, said at the final press conference, European Council President Donald Tusk. According to him, until April 12, “all options will remain open” and London will still have a choice between a deal with Brussels, that is, exit from the EU according to May’s ratified parliament, “no deal, lengthy postponement or withdrawal of article 50”. Participation in the elections to the European Parliament is a prerequisite for any long Brexit postponement after May 22. In other words, if the British are not determined before April 12, they will be faced with a dilemma - either a “hard” exit from the EU, or a “soft” one. or they should pick up the exit application. 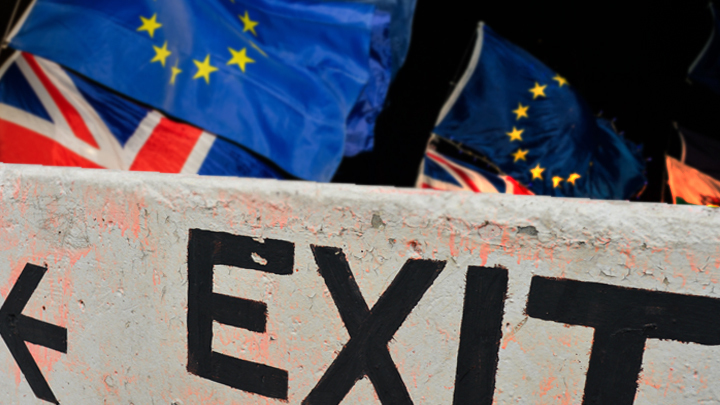 Brexit will not take place on March 29, as originally planned. Everything is clear. All decisions are now made in London. Britain will be accepted back only if it publicly admits that it is wrong and will henceforth behave differently. And only on these conditions. It is clear that Britain, if it decides to stay, which will require May’s resignation, early elections, and, possibly, a repeated referendum, will lose all the privileges that it had in the EU. It cannot be ruled out that London will also roll out a decent bill for losses that the EU has already incurred in connection with the attempt to “escape” Britain from the community, which you can enter, but it is almost impossible, as we see, to get out. Which way will choose London, we will soon find out. But the chairman of the European Commission (EU government), Jean-Claude Juncker, is apocalyptic. In response to a question from journalists at the final press conference, how long a postponement could be after May 22, he replied: "Until the very end." A few days ago, the EU took regular preventive measures in the event of a “tough” Brexit - on a temporary and mutual basis in Brussels are ready to maintain existing ties with Britain in a number of areas, in particular, in the field of sea and air transport, education, if parting with the islanders is stormy and catastrophic. Similar measures are being taken in Britain. In a nuclear bunker in London, under the building of the Ministry of Defense, a group of officials has already begun work, who will coordinate government actions in the event of a “tough” Brexit. Everyone is preparing for the worst. Clearly, most EU leaders would like to avoid a “tough” Brexit. German Chancellor Angela Merkel assured the Bundestag deputies that she would “fight until the last day, until the last hour” against such an outcome. She advocates “orderly” Brexit, which indicates that Berlin is in fact not at all opposed to the exit of Britain, as this will allow Germany and France to take the fate of Europe into their own hands. The political situation in Britain has become completely intolerable and chaotic. Premier blames parliamentarians. In the ruling class, Brexit caused a split between its overtly globalist and more soil part. Split among the people. But now the people are more likely to support globalists than euro skeptics. In the national outskirts of the United Kingdom, especially in Scotland, the majority of EU supporters. On Thursday, a petition by Brexit opponents demanding not to leave the EU, posted on the website of the British Parliament, in a few hours gained more than a million votes. This has never happened. Meanwhile, the chances of the adoption by the House of Commons of the agreement on the country's withdrawal from the EU are completely unclear, because the government did not explain exactly how it intends to overcome the ban on Speaker John Berkow to put to the vote the twice rejected plan. No changes can be made to her plan following the talks in Brussels, since nothing new has been said there. It seems that the prime minister has only one option - to somehow break the speaker’s resistance and ask the deputies to vote for her plan for the third time, promising to leave her post in the near future. According to the British media, this option may be of interest to euro-skeptics in the leadership of the Conservative Party, signaling that in this case they can support it. These power-hungry politicians, but fearful of early elections, are hoping to take the best terms of the deal for Britain, taking the negotiation process with Brussels in their hands after May’s departure. However, the Labor Party will still vote against it. Their leader Jeremy Corbin, who arrived at the EU summit in Brussels, also said that Laborists are determined to find a form of agreement that would rule out a way out of agreement and ensure constructive relations with the European Union in the future. He proposes, in fact, to formally leave the EU, without changing anything, but he is ready to hold a new referendum on Brexit, as well as to early elections. The madhouse organized by the British is not only annoying to everyone - everyone is openly laughing at them. French Foreign Minister Natalie Loiseau, for example, called her cat Brexit, because it constantly meows, asks to be released outside, but as soon as the door is opened, it stands and looks at the owner with surprise. The situation with Brexit is in this state at the moment. This thriller should end sooner or later, and then its consequences begin.